Friday Jan. 27 President Trump signed the Executive Order temporarily suspending the admission of persons from 7 majority Muslim (failed) states that succumbed to terrorism. The fundamental question is: to whom are political leaders beholden? To their citizens, or to the entire world? The core question every leader needs to answer is, what is the proper function of a country, if any? Feb 10, 2017 Sean Hannity Interviews Retired Marine Steven Gern After His Immigration Video Went Viral. ACLJ Jay Sekulow: "President Trump should write another Executive Order TONIGHT. Make them fight it." Judge James Robart, of the U.S. District Court for the Western District of Washington State, believes there is no basis for President Trump's executive order temporarily suspending non-American entry from seven terrorism-plagued countries. In court last week, Robart questioned Justice Department lawyer Michelle Bennett about the administration's decision to confine the moratorium to Somalia, Libya, Yemen, Syria, Sudan, Iraq, and Iran. "Have there been terrorist attacks in the United States by refugees or other immigrants from the seven countries listed, since 9/11?" [asked Robart, KT] (...) "Let me tell you," Robart said. "The answer to that is none, as best I can tell. (...) Now, it turns out Robart might not know as much as he let on. Last summer, the Senate Judiciary Subcommittee on Immigration and the National Interest analyzed public sources of information, seeking to learn more about people convicted of terror-related offenses. The Justice Department provided the subcommittee with a list of 580 people who were convicted — not just arrested, but tried and convicted — of terror-related offenses between Sept. 11, 2001 and Dec. 31, 2014. The subcommittee investigated further and found that at least 380 of the 580 were foreign-born and that an additional 129 were of unknown origin. Of the 380, there were representatives — at least 60 — from all of the countries on the Trump executive order list. And with 129 unknowns, there might be more, as well. Dutch Veep PM Lodewijk Asscher @LodewijkA, Socialist parties and anti discrimination groups protesting in The Hague against Trump admin "extreme vetting". While the Dutch Prime Minister @MinPres is in hiding so he doesn't have to take a position in the general election campaign, the Socialist VPM has no such qualms (more). Opposition leader Geert Wilders meanwhile is all for Governments protecting the people instead of sacrificing them on the globalist altar of multiculturalism. President Trump explains it in terms even the Dutch Vice PM might understand. And while the media spoke of "thousands of protesters" @Seven has the real picture LOL The police had to intervene when some of the most fanatical protesters prepared to go to the US Embassy after the demo. Update: The PM Mark Rutte emerged and was caught on camera during a debate in a The Hague school ripping into the Trump "ban": "I can understand it's necessary to stop terrorists, but banning people isn't the solution". Who cares about the facts when it comes to bashing Trump. Jan 30, 2017 Stephen Miller Full Interview on Fox & Friends. The matter of the Trump extreme vetting has weeded out the hypocrites in a spectacular way. Obama has done exactly the same in 2011 and not a peep from the Democrats, the eurocrats and the loony left. Obama used the precise same list of countries without functioning Government, making proper vetting impossible. Where were they when Obama slammed the door in the face of Cuban refugees just before he left office? White House spokesman Stephen Miller has the details. The "extreem vetting" EO has flushed out a detail that is easily overlooked. If you love your country, you want to keep it safe -- even at your own expense. A little inconvenience at the customs is a small price to pay. To people prove it: an Iraqi anti terror agent and Breitbart's editor Raheem Kassam. Imagine being an Iraqi soldier fighting ISIS, America's enemy. Trump has banned you from US and said he wants to steal your country's oil. Saturday night an Obama appointed Judge ordered a nationwide stay on visa and green card holders who reached US soil. They can be detained, but cannot be deported. And the stay doesn't apply to passengers in transit. For those wondering why Saudi Arabia and Pakistan are not on the list, note that with the exception of Iran, the others on the list i.e. Syria, Iraq, Sudan, Libya, Somalia and Yemen are countries without a central Government. They are failed states or may soon be. It is impossible to vet the identity of citizens from these states. They have no operative security apparatus. The test is not religious, it's terrorism. David French at the NRO -- no Trump supporter -- takes an objective look at what Trump's Executive Order a.k.a. "the Muslim Ban" entails. For all the hysteria, it's less impressive than you might think. But let's talk some principles here. First of all, every country has the right to determine who they want to admit and who they refuse. This is because a Government's first duty is, to protect the safety and wellbeing of its citizens. This is exactly where globalists like Merkel c.s. go wrong. In fact, they are valuing the human rights of refugees over the human rights of their citizens. This is the core of the present clash between globalists like Merkel, Trudeau, various eurocrats and national democrats, as Trump, Netanyahu, Abe, Modi, Le Pen, Wilders et al. First, the order temporarily halts refugee admissions for 120 days to improve the vetting process, then caps refugee admissions at 50,000 per year. Outrageous, right? Not so fast. (...) The bottom line is that Trump is improving security screening and intends to admit refugees at close to the average rate of the 15 years before Obama’s dramatic expansion in 2016. Obama’s expansion was a departure from recent norms, not Trump’s contraction. Travellers with valid visas have reportedly being prevented from boarding flights and turned away at US border control after Donald Trump signed an executive order banning citizens of seven Middle Eastern countries from entering the United States. Mr Trump signed an executive order closing US borders to all refugees for a period of at least four months and temporarily banning all travellers from half a dozen countries, regardless of whether they have already been issued visas, on Friday evening. "We want to ensure that we are not admitting into our country the very threats our soldiers are fighting overseas" (...) "We only want to admit those into our country who will support our country and love deeply our people." The order, which came into force as soon as Mr Trump signed it, requires US border officials to turn away any traveller from Syria, Iraq, Iran, Sudan, Libya, Somalia and Yemen for the next 90 days. With only a few exceptions for diplomats and dual citizens, the order takes no account of whether travellers have already been issued with visas or have visited the United States before. 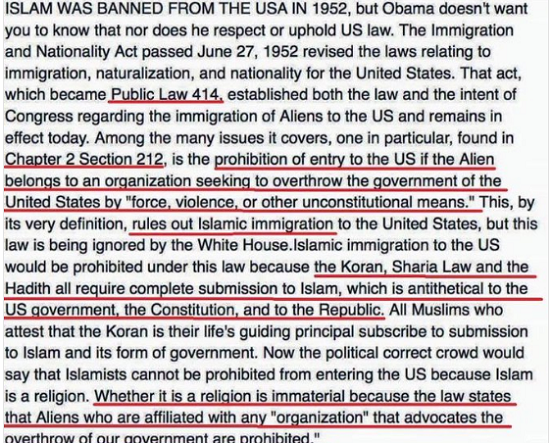 There is no "Muslim Ban". There is a ban on 7 Islamic countries from which terrorists and radicals have already harmed Western world.